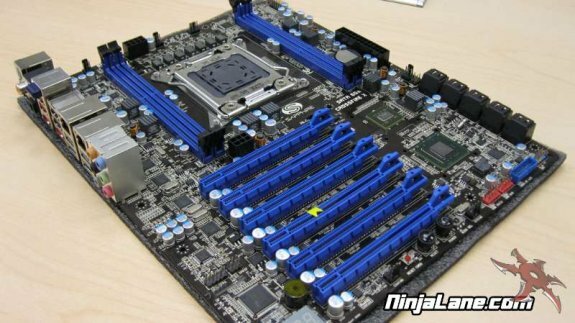 Ninjalane visited Sapphire and got to see an Intel X79 based motherboard, you can check it out over here. There weren't a whole lot of different motherboards to see during my visit but I did get to check out the new Pure Platinum Z68, the Pure Black 990FX and the Pure Black X79. By the looks of it all of the designs are complete and ready to go, minus a few heatsinks. The Sapphire Pure Black X79 is pictured below, the prototype features a whopping six PCIe x16 slots.